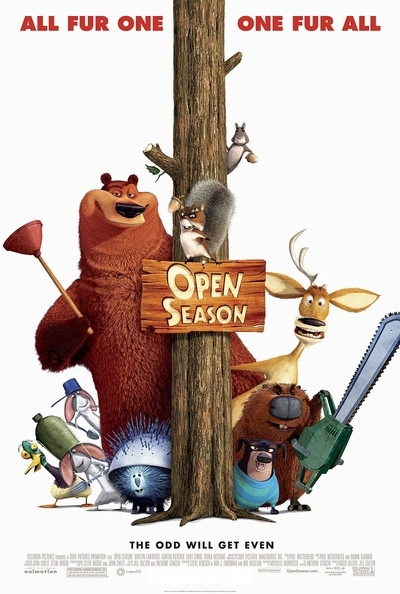 Story: In Columbia Pictures' new action-adventure comedy Open Season, the first feature-length animated film from Sony Pictures Animation, Boog (Martin Lawrence), a grizzly bear with no survival skills, has his perfect world in the tranquil town of Timberline turned upside-down when he meets Elliot (Ashton Kutcher), a scrawny, fast-talking wild mule deer. Elliot arrives in Timberline missing an antler and strapped to the hood of a truck, courtesy of the paranoid uber-hunter Shaw (Gary Sinise). Against his better judgment, Boog frees Elliot. Elliot attempts to return the favor by "freeing" Boog from his idyllic existence with his beloved Park Ranger Beth (Debra Messing), who raised him since he was a cub. Things quickly spiral out of control. The two troublemakers are relocated together to the wild...just three days before open season! With hunting season upon them and Shaw in hot pursuit, Boog and Elliot must learn to work together and unite the woodland creatures. In a rowdy, madcap battle, they make the woods safe once and for all by turning the hunters into the hunted.